Elanco Animal Health announced some new FDA approvals for it’s Rumensin products. The U.S. Food and Drug Administration (FDA) has granted approval for feeding Rumensin to dairy cows in component-feeding systems. These systems include supplements that are fed in the parlor, in electronic feeders or as a topdress. The minimum feeding rate for these supplements, which can be fed both to dairy cows on pasture and dairy cows in confinement, is one pound per head per day. The new label for Rumensin has updated mixing and feeding directions for these supplements, which the FDA calls Type C medicated feeds. 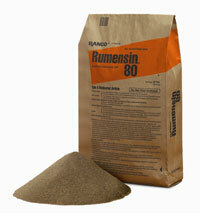 The FDA also has expanded the Rumensin label to allow feeding to dairy replacement heifers that are raised in drylots.